It feels like a lifetime has passed since we spent a month in The Netherlands, but in truth we’ve not even been back six weeks yet. 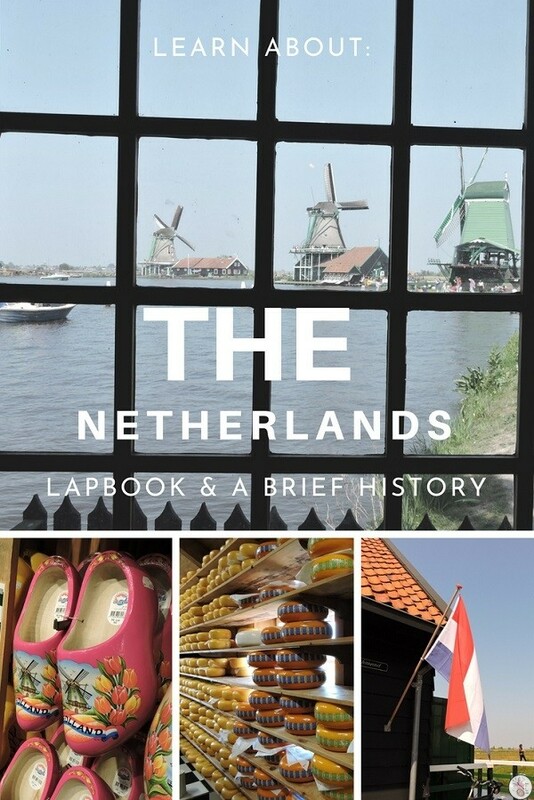 It’s taken us a while to get back into the swing of things, but we’re back on track, and we’ve finally had a chance to finish our Netherlands Lapbook. 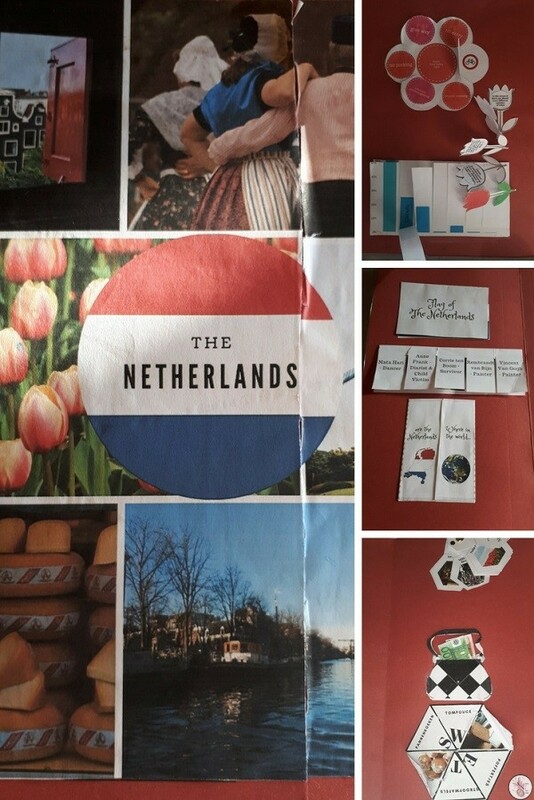 Whilst on our holiday and in our learning since, we paid close attention to 9 areas of life in The Netherlands, which I’ve combined into a lapbook. As we came across each of the areas, we learnt about them and glued the appropriate counterparts into the Netherlands lapbooks. There are two other downloads for this unit – A brief history of the Netherlands in World War 2 and all the information below in a printable format. 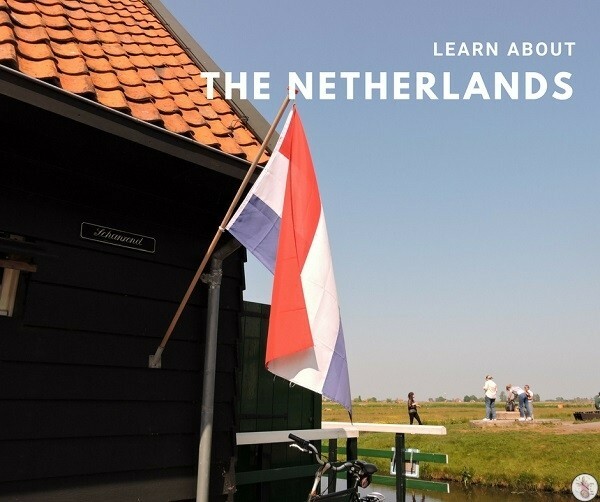 The flag of The Kingdom of the Netherlands – divided into 12 provinces, of which two are North Holland and South Holland – is made up of three rectangles in red, white and blue. At one time this tricolor flag was orange, white and blue, as those were the livery colours of William of Orange, a Dutch prince. In the 17th century, red replaced the orange as a flag color, because the orange dye used on the flag was unstable, and turned red after exposure to the sun. 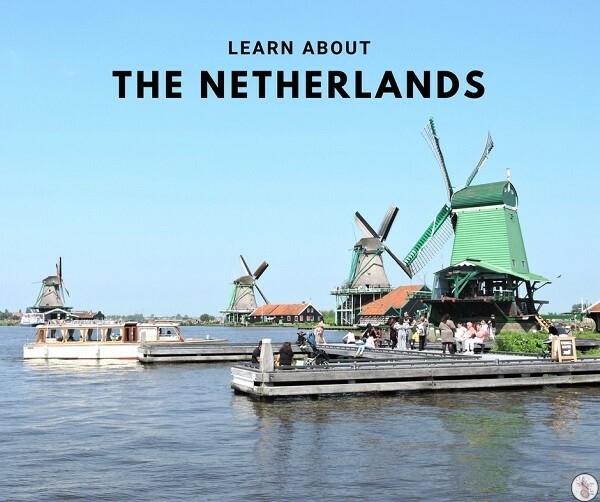 As mentioned above, “Holland” is generally referred to when “The Netherlands” is meant. There are 12 provinces – Zeeland, Noord-Brabant, Utrecht, Flevoland, Friesland, Groningen, Drenthe, Overijssel, Gelderland and Limburg and North and South Holland. The Netherlands are in Northern Europe, and to make things a smidgen more complicated, they are included with Belgium and Luxembourg as Low Countries, or Benelux Countries. – Canals. This country is mostly meant to be under water, so the sheer amount of the place that’s been reclaimed from the sea is astounding. The canals played an important part in Dutch commerce and development, and many still do. – Clogs. 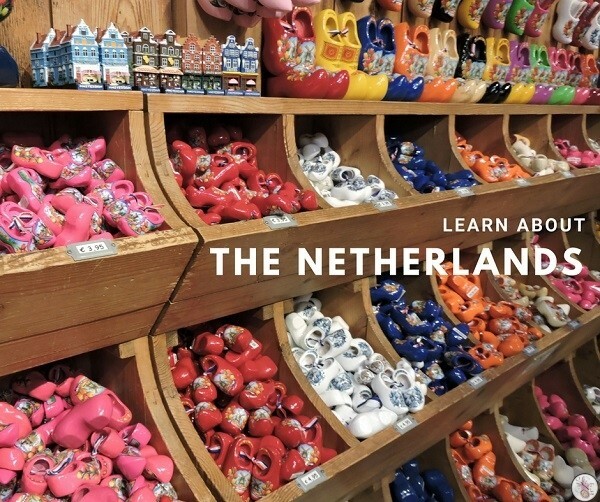 Historically, these wooden shoes were made to keep feet dry in the fields, since no other shoes would do the job! They are literally carved out of logs of wood, and worn with socks are not as uncomfortable as you might think! – Bicycles. Cycle culture in The Netherlands is phenomenal. You can cycle almost anywhere, even along the motorway. Cycle lanes are beautifully maintained and cycling is just so easy, even for young children. 84% of people in The Netherlands cycle, and of the 17 million inhabitants in the Netherlands, 13.5 million are cyclists and they own 22.3 million bicycles in total4! Also 30% of Dutch families don’t own a car 5! In The Netherlands, compared to most other countries, cycling can also be something of a status symbol! – Tulips. Tulips were brought to the Netherlands from Turkey. They were so valuable that at one time they were used as currency. At the peak you could buy a houseboat for the price of a tulip bulb. – Cheese. The reclaimed land in the Netherlands is really fruitful, so grass grows really well. This means that cattle fare very well and produce plenty of milk. In fact, in the 19th century milk was more abundant than water. It’s said that Dutch people – who were small people originally – became among the tallest in Europe as a result of all the milk, and the Netherlands became a major cheese producer because of all the excess milk. Non-religious (50.1%), Roman Catholic (23.7%), Other Christian (20.1%), Islam (4.9%), Hinduism (0.6%), Buddhism (0.4%), Judaism (0.1%) We did have a good discussion about why there are so few practicing Jews in The Netherlands. Euros are used in The Netherlands now. The Dutch have a very interesting pallet with some unique foods. Pea soup is high up on the national dishes list, but we don’t like peas, so we focused on deserts. Olliebollen are like apple-y donuts. Tompouce is a custard desert. Stroopwaffels are a caramel-flavoured waffle that’s perfect with coffee. Pannekoeken are pancakes. And that’s just the start! We also did a brief and mostly child-friendly history of the Netherlands in World War 2. I read a lot and then wrote it up in simpler terms. You can download it here. 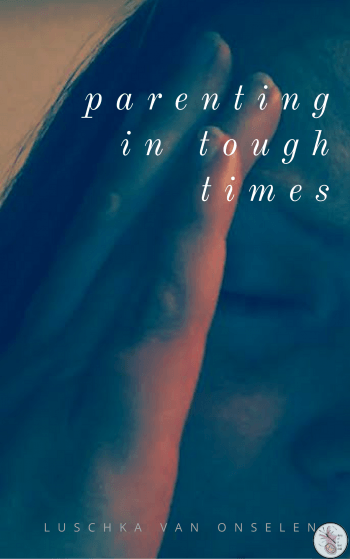 Download the lapbook here! You will be added to our irregular mailing list (I rarely have time to send them out!) but you can unsubscribe at any time. Should you prefer to buy the lapbook and not sign up to the mailing list, you can do so at Teachers Pay Teachers. Have a look at our other lapbooks here.